Ramblings of a Climate Pilgrim... 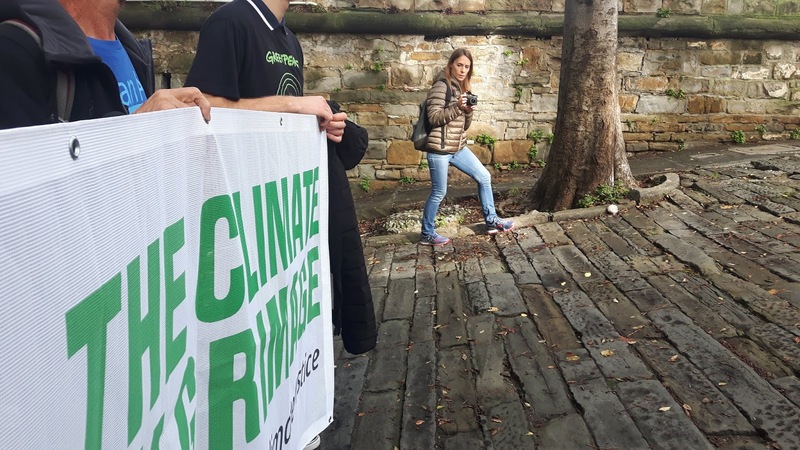 In October 2018 I embarked on a 1,000km walking pilgrimage to COP24, the UN Climate Summit. Here are some thoughts before, during and after. 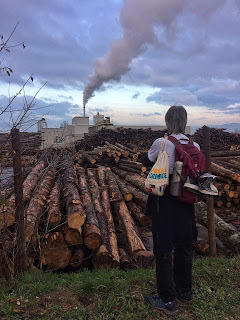 "An interdependent world not only makes us more conscious of the negative effects of certain lifestyles and models of production and consumption which affect us all; more importantly it motivates us to ensure that solutions are proposed from a global perspective, and not simply to defend the interests of a few countries. Interdependence obliges us to think of one world with a common plan." (Laudato Si, 164). 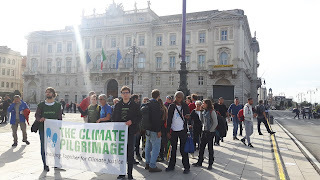 Part of this Climate Pilgrimage involves many events and actions. When we are not walking 24-30kms per day, we are speaking in schools, parish centres, meeting with climate activists, Mayors, church leaders or perhaps helping AG paint one of his amazing murals. 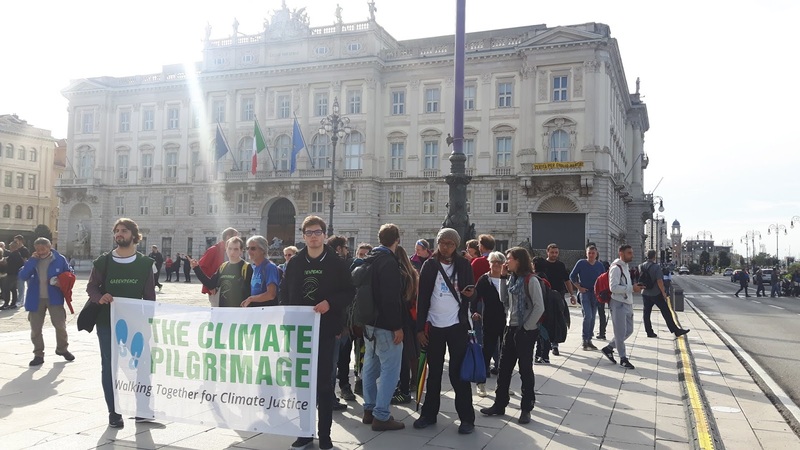 Last week, in the port city of Trieste, Greenpeace Italy arranged for us to meet with Generali, Italy's third largest insurance company. 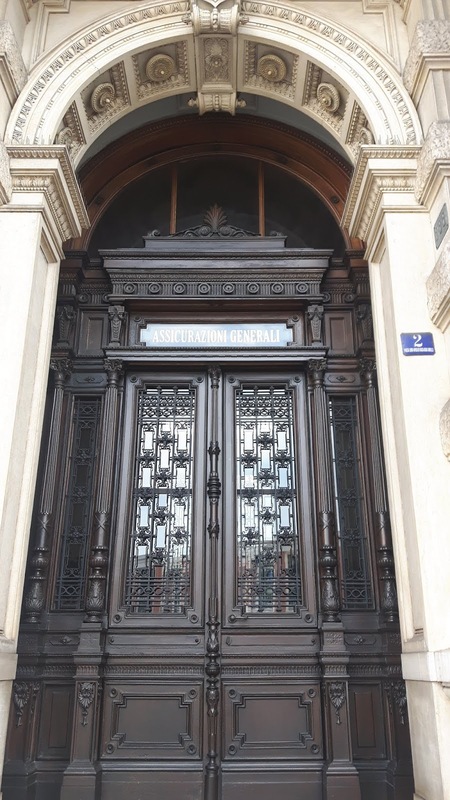 The meeting took place in their beautiful offices in central Trieste; we walked from the Cathedral in procession with many supporters to the offices of Generali. Gathered outside the main building Luca Iacoboni (Greenpeace Italy campaigner) handed us postcards to write on. These postcards had images of natural disasters from our home countries which have been attributed to climate change in the past year. The postcards were addressed to the Managing Directors of Generali. 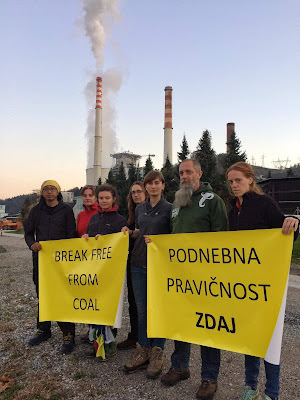 Each of us wrote a message pleading with them to be brave, be a climate justice leader, to turn away from fossil fuel investment and to stop insuring coal companies. We entered the Generali building and were met by the member of staff who oversees corporate responsibility. 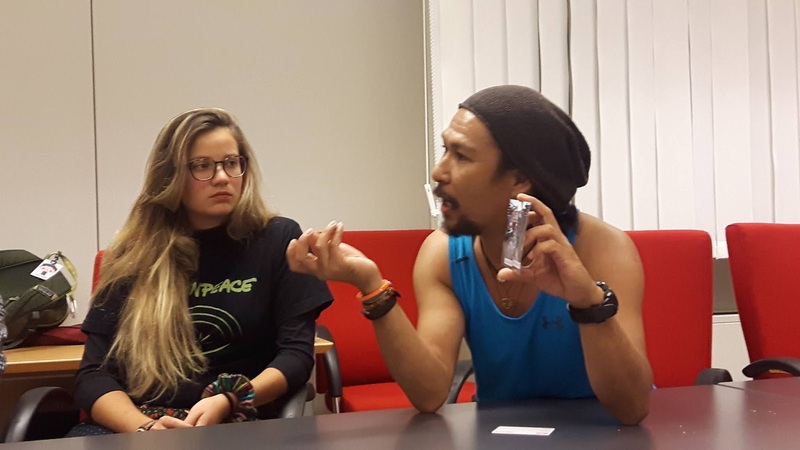 Our Philippino pilgrims shared with them the suffering which has been inflicted on the Philippines because of the climate crisis and also their harrowing experience of Super Typhoon Haiyan, which killed 15,000 people in 2013. While these negotiations in big companies can be complicated and drawn out, Greenpeace Italy had laid the groundwork over recent months. Last night, as we were preparing dinner in an old school house in the mountains, we got the message that Generali had reached an agreement with Greenpeace and have commited to stop insuring new coal mines. 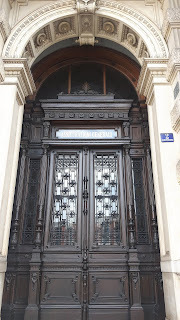 I was really amazed as we had mixed feelings about how our meeting had gone with Generali. While the stories from the Philippines are terrifying and should be a wake up call to the whole world, I was unsure if we had touched the hearts of those we spoke to. Something shifted for this announcement to have been made yesterday and for me it shows the power of the narrative that AG, Albert and our whole group carry on this pilgrimage. Our Philippino brothers are the real faces of the climate crisis, so for me this campaign concerns more than something that is happening to people far away from me, this is now about my friends and their loved ones. Now it's personal. When we speak in schools I now look at the students we speak to and am fearful for them. The transformative power of this pilgrimage becomes more visibile day by day, step by step. 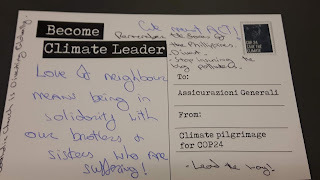 In Ljubljana some days ago we met with a Laudato Si study group, all young women who are university students. 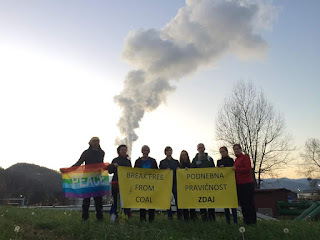 At another event later that night we met with a representative from Slovenia's Ministry for the Environment and the person who had translated Laudato Si into Slovenian. Climate scientists gave their data on the impacts of climate change so far in Slovenia and theologians unpacked the richness of Laudato Si for those present. We are all working together for a common cause. 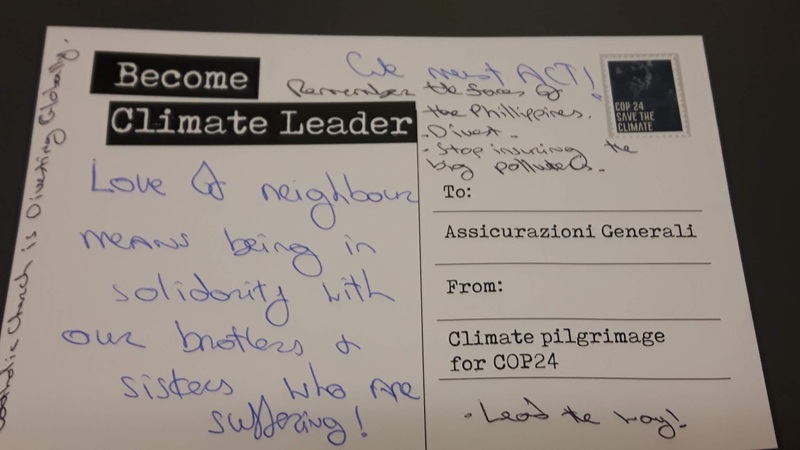 One young person from the audience asked if she could set up her own Laudato Si working group in Ljubljana and a Jesuit priest who was present committed to work with her on this. So while the climate crisis seems huge and impossible, I am witnessing a conversion of hearts, one person, one village, one company at a time. climate change from now on, I will see the faces of AG and Albert. That is key, to really SEE the other person. Love of neighbour in this context involves action and it has no time for indifference. "We know that technology based on the use of highly polluting fossil fuels, especially coal, but also oil and, to a lesser degree, gas - needs to be progressively replaced without delay...Although the post-industrial period may well be remembered as one of the most irresponsible in history, nonetheless there is reason to hope that humanity at the dawn of the 21st century will be remembered for having generously shouldered its grave responsibilities." (Laudato Si, 165). Thank you Jane! This is beautiful. Thank you so much for sharing this post! Are you looking for a best tour services in India then book this tour packages north east india one way at very affordable price. So plan you trip and book here. The Simple Way ~ Christian community living plotting goodness! Jane Mellett 2012. Picture Window theme. Theme images by ImagesbyTrista. Powered by Blogger.